You may think this is a story you know—residential school horrors. Or at least one that’s already been told. While the gist of the horrors has been conveyed over the years in books about the horrors… and documentaries about the people involved in the horrors… and articles in magazines and papers, more and more in recent years covering the horrors from various angles… still, all of that is different than this book, which is a personal account by a man, now in his eighties, who lived the horrors from age eight to fourteen. What makes his account in The Education of Augie Merasty different from what we already know about the story is that he’s able to tell the story at all. He’s an alcoholic, often homeless, sometimes in rehab. Many of the people who shared his childhood are also drunks, druggies or dead. Many by suicide. Most of them aren’t writing memoirs. That’s the familiar part. That and the abuse, the hypocrisy, the cover-up, the abdication by governments, and so on. The surprising part is that this isn’t the stuff Merasty wants to talk about. He wants to keep things positive. For his own sanity I suspect. How he finds The Positive is both a testament to the power of survival and a tiny miracle of human spirit. In 2001 he writes to the University of Saskatchewan asking for someone to help him get his story on paper, someone with a “good command of the English language”. The someone turns out to be David Carpenter, a professor at the university. In his compelling introduction Carpenter explains the process of meeting and communicating with Merasty, a retired trapper who is hard to pin down and not especially disciplined or organized about handing in his notes. The back and forth goes on for more than a decade. The memoir itself takes something like 75 short pages. Merasty begins by listing what he refers to as the ‘kind’ or ‘jolly’ people at the school. What he’s really doing is working himself up to remember the not so jolly. The “nice ones” include people who would throw blocks of wood at the children and call them bastards, occasionally strapping them. At no point does he get maudlin nor does he blame. He simply says here are some of the things that happened. We know enough about the story that he doesn’t have to tell us the gruesome details. I’m guessing the details are the irrelevant part anyway. I mean how hard do you have to hit a kid, how many times do you sexually abuse them, how long do you starve them, what kinds of names or threats or other horrors do you hurl at them or force them to live through before it matters enough that it needs to be added to the list? That it happened at all is the point. And that thousands upon thousand of lives have been affected by not only the abuse but the way the rest of the world turned its head. Still turns its head. There’s the point. Details, well, they’re just that. There are a few though. The time he and a friend each lost a mitten on an outing the day before and were made to retrace their steps in minus 40 temperatures. He didn’t find his mitten and on his return he was strapped twenty times on each hand. He was eleven years old. There was the stale porridge they ate while watching trolleys with white linen and fresh eggs, meat and cake being delivered to the adults. There was the dreaded Brother Lepeigne, sexual abuse, beatings for smiling, for accidentally farting. For nothing. The reason to read this book is not to know his story, because I suspect there’s much that isn’t being told, that can’t be told, even now. The reason to read it is to understand the courage it took to write it. And to understand that there are thousands and thousands and thousands for whom he speaks. The residential school system ran from the 1840’s to 1996. Think about that. The last entry in the book is a drawing, a sketch Merasty has made of a northern scene, apropos of nothing that has come in the pages before and yet it makes perfect sense. It’s perfect, because it rings true. 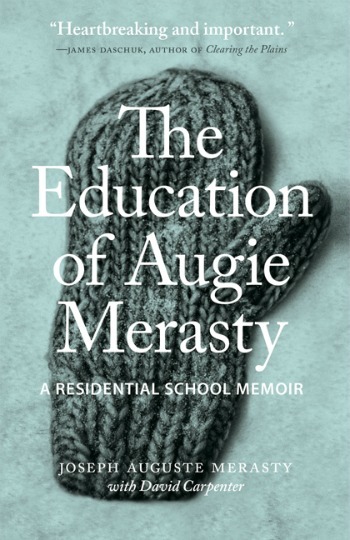 The Education of Augie Merasty (University of Regina Press) can be ordered online at Blue Heron Books. As usual, I love your non-review, and it’s made me want to read the book. I love the mitten on the cover (and now I know why it’s there). “The reason to read it is to understand the courage it took to write it.” Yes. It’s a beautiful book. As much about the rather thin, but important relationship between David and Augie as it is about Augie’s experience at the schools. Agreed. Their relationship, and how the book developed, is an essential piece to helping understand something of Augie ‘today’. Extraordinary accomplishment on both their parts. Kudos to University of Regina Press too.